Former Durango Police Capt. 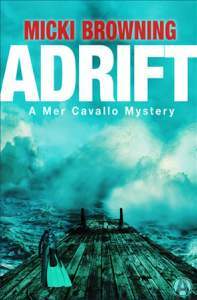 Micki Browning has just released Adrift, her first mystery novel. Since retiring, Browning has moved to the Florida Keys and now has much greater opportunity to enjoy her love of deep-sea diving. This led to the birth of Adrift and the creation of the Mer Cavallo mystery series. Cavallo is new to the Keys. She is unfamiliar with the area because she is a marine biologist who has just arrived after doing research on octopuses (not octopi as commonly thought) in the Arctic. She is working at the Aquarius Dive Shop, a temporary job, until she can get her next academic research position to fully use her expertise and her Ph.D. The owner, Bijoux, who hails from Haiti, is a colorful woman who aspires to smooth the rough edges off Cavallo’s “just the facts” mentality. Captain Leroy, skipper of the Luna Sea, is a warm, solid character who enjoys his verbal sparring with Cavallo. Cavallo is just easing into a comfortable life in the warmth and humidity of the Keys, when a random rescue at sea turns into a social media free-for-all. This all begins during a tour, when a diver, who somehow traveled five miles from his ship, is saved by Cavallo. The diver, suffering from severe panic, claims he was pursued by a ghost, or presence. His repeated story is uploaded to YouTube by divers from Cavallo’s ship, resulting in a media welcome party when they dock back at their home port. Let the paranormal circus begin. This dismays scientist Cavallo, who does not believe in ghosts. At all. The next morning, Cavallo is greeted by a strange, intense man named Ishmael Styx. Ishmael is the co-owner of Spirited Divers Paranormal Scuba Team and wants to charter an entire boat to find evidence of the ghost seen at the site of the Spiegel Grove shipwreck. The paranormal team is working on a documentary about ghosts and responded quickly to the sighting by the lost diver. Styx requests Cavallo personally to be the safety diver for his chartered nighttime dive trip because she would make a credible witness when they gather the “proof” of the ghost’s existence. As the trip progresses, Cavallo is alarmed to find that one member lacks real dive experience. As the dive unfolds, Cavallo’s misgivings are proven correct when the diver suffers a panic attack and must be helped to the surface. After they finally get back on board safely, Cavallo is shocked to discover that Styx didn’t make it back. He’s disappeared. Cavallo and another team member return to the wreck, but still no Styx. Searchers will return in daylight, but by then it will be a recovery mission and not a rescue. Cavallo spends most of the night being questioned by Detective Talbot, a member of the Sheriff’s Department dive team. Styx’s disappearance drives Cavallo to try to make rational sense of what happened. As she pursues her quest, she becomes a target, then yet another of the paranormal team becomes a victim. Blended into this action is the threat of an approaching hurricane, another ghost sighting and then, an unexpected appearance of Cavallo’s former love. Her hands are full trying to solve the mystery and escape the clutches of a killer. Adrift is a marvelous debut novel. Browning’s descriptions make readers feel the sticky heat and humidity of the sultry climate of the Keys. She introduces readers to the fascinating world of scuba diving. Her characters are believable and intriguing. Browning makes the reader unfamiliar with the setting and culture of the Keys want to learn more about the area, and especially curious about what will happen next in Cavallo’s life. Luckily, the next novel, Beached, is coming soon. Q: How long did you work at Durango Police Department? A: From 2004 to 2011. Q: When did you move to the Keys? A: We moved in 2011. (We is her Partner in Crime/aka her husband). We planned to live six months in Durango and six months in the Keys. The back to Durango didn’t happen. Q: How long did you work on Adrift? A: It took me a little over a year. I entered it in the Daphne du Maurier contest and I won first place for best unpublished mainstream mystery. One of the judges was an agent. After the contest was concluded, we talked, and she became my agent. She sold it in six months. Q: Why is Adrift an ebook and not hard copy? A: Random house has different imprints, and Alibi does digital releases only. By releasing an ebook, Random can get the story and the author out there and build up interest and fans. It can be a great way to get the word out for a new author. Q: What are your plans for the next book in the series? A: My second in the Mer Cavallo series is called Beached. It is with my agent now. I’m completing my final revisions, and as soon as those are finished, my agent will submit the story to the publisher for consideration. If Alibi picks it up, it will remain digital. Q: Which secondary characters might you carry over to following books? A: All of them will be returning with Mer. The paranormal dive team crew which is featured in Adrift will not though. Q: Will the series stay in the Keys, or might Mer travel to other locations? A: All of Mer’s adventures will remain in the Keys. Q: You state that you got your start in writing nonfiction while you were in law enforcement. How is fiction different for you? A: Nonfiction is built on a foundation of truth, and facts are easy to document. There are no limits to fiction, so controlling the story requires more decisions, more discipline to wrangle the story into a cohesive whole. Readers have certain expectations, and structuring the story is important. Q: With all your experience in law enforcement, why not write a police procedural? A: As much as I enjoyed bring an officer, I needed a break from it. Concentrating on a fish-out-of-water character in the Keys allowed me to play the “what if?” game while I adjusted to my new profession as a writer. Now that I have some distance, it will be much easier for me to tell a police procedural, and one is on the horizon. Q: How did you come up with the idea for Adrift? A: I obtained my basic SCUBA certification in the early ’80s when I lived in California. I recertified while living in Durango. When I moved to the Keys, I dove far more frequently, and obtained my professional rating. One night, there was a medical emergency on the boat. The diver recovered, but it prompted a slew of “what ifs?” Couple that with my favorite dive – the Spiegel Grove – and Adrift was born. Q: How do you write your mysteries? A: There are two kinds of mystery writers, those that plot and “Pantsers.” They are writers who go by the seat of their pants. Just letting the words go. I’m a hybrid. Mystery readers have certain expectations, and so I have to be aware and meet the milestones and turning points for the fans. Adrift, by Micki Browning, is available as an e-book. For more information, visit https://mickibrowning.com/adrift/.